There is a center for mentally handicapped people just around the corner of our house. 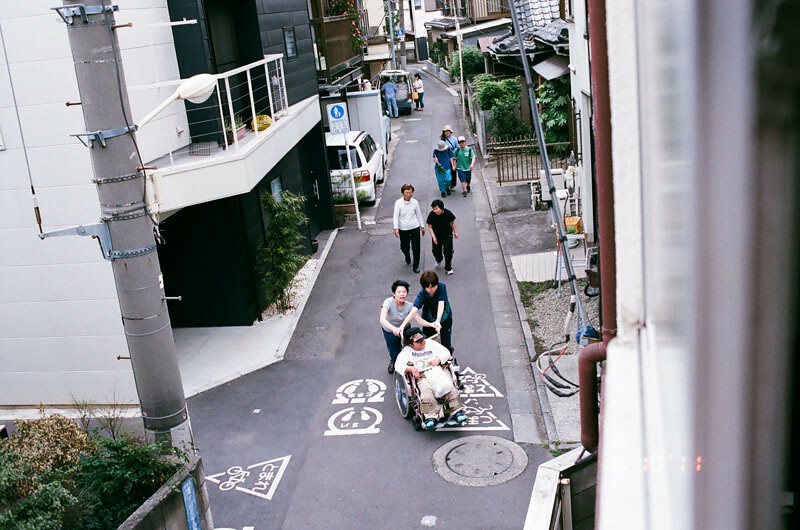 The staff usually takes a group of five or six handicapped people out on a walk along a route that passes our house a few times a day. Sometimes when I am in the office, I hear screaming or excited noises outside, so I run out onto the balcony with my camera thinking it would be something crazy, but it usually turns out to be just them, whom, you could say, are also a bit crazy (tasteless, I know). At first, when I began documenting the streets around my house from my balcony, I consciously avoided taking their picture even though they passed by everyday because to do so, of course, was morally taboo and it just seemed mean/exploitative… but as weeks went by, the more I thought about it, the more I realized that was exactly why I should shoot them- not for the sake of being mean or exploitative- but because to do otherwise was straight-up discrimination just because they were different or special… If you treat handicapped people like every other bald guy, construction worker, school kid, pigeon, or cat that walks by than they are just as much a part of this world as everyone else. My heart still pounds every time I take their photograph though. I know it is not because what I am doing is intrinsically bad, but because I am afraid of what would happen if the neighbors actually saw me. i watched most of it this morning. i like bbc's genius of photography... it's epic and meyerwitz is in that too.